Mark Rein from Epic says that the technical capabilities of Nintendo's 3DS handheld cannot handle the Unreal Engine. Epic Games is trying to break into the handheld market but it is largely ignoring Nintendo's buzz-worthy device. Mark Rein, VP at Epic, said in an interview that he hasn't seen a 3DS yet but, based on the information that he's read, the company's Unreal engine wouldn't be able to run on Nintendo's 3DS. 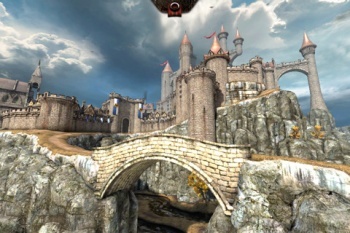 Epic debuted a downloadable demonstration for its Unreal Engine on Apple's iDevice platform last month by letting you walk through a medieval castle. The Epic Citadel looked super pretty and it garnered more than a million downloads in just under two weeks. It seems that Epic is betting on Apple for its handheld strategy and that's partly because Nintendo hasn't approached Epic to try to get its software to run on the 3DS. "We really don't know enough about it to make a formal comment, but I think if they considered that our engine would be good on it, they would have probably talked to us about it," Rein said. Of course, this could all change if and when Epic gets its hand on a demo 3DS device, but the fact that Ninetendo didn't reach out to them seems to point to no games using Unreal on the new handheld.